What’s the first thing that comes to mind when you think of caviar? “Oh, what a delicacy!” or “Ew! Fish eggs.” Whether you’re a fan or foe, National Caviar Day is celebrated nationwide on July 18 every year. Technically, real caviar isn’t just any fish eggs. It comes from the the female sturgeon fish. And it’s been a high-end dining staple ever since Cesar Ritz, (fancy hotelier) put it on his menus. Impress your guests and impart some roe knowledge upon them as they dive into this appetizer experience. It’s a perfect excuse to use the fine china and makes great conversation. Whether you’re a seasoned caviar eater or have never tried it before, take your taste buds on an adventure by ordering it at your local, upscale restaurant. There are several kinds of caviar, although the small black or gray colored roe is technically the most caviar - caviar. The pink or orange colored “caviar” actually comes from salmon. Find both to taste and compare which is better to you. The word "caviar" comes from the Persian word for "egg"
Caviar ranges in color from dark gray and yellow-gray to brown-black. 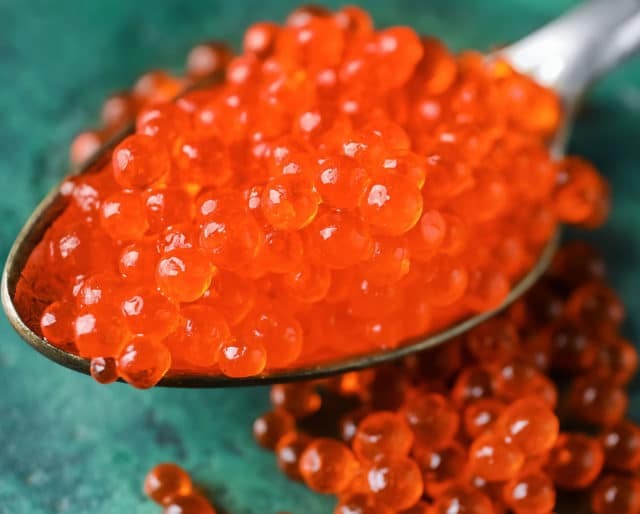 Red 'caviar' is actually salmon roe, not caviar. Caviar, within its various sizes and colors offers an array of nutritional value. A serving of caviar contains a healthy dose of phosphorus, protein, calcium, selenium, iron, magnesium, and Vitamins B12 and B6. Part of the reason why real caviar is an expensive delicacy is because it is the roe of sturgeon found only in the Caspian and Black seas. Due to overfishing in the 1900s, this industry is regulated and limited which drives up the value and price. If you find yourself at a fancy enough restaurant, you may find caviar on the menu. It is served raw in a petite bowl or plate over ice. People eat it with an adorably small spoon either alone or with bread. Pinky up and open wide!